I know I had alot of David Boreanaz posters on my walls as a teenager though! Loved my Buffy & Angel 🙂 (Still don’t mind him actually!) I think there were a few Leonardo Di Caprio ones as well. Pretty sure others ranged from hot guys in Home & Away (Remember we’re talking back in the day when it was good 😉 lol in the late 90’s! ), Blue Heelers, Water Rats, “Five”, “Human Nature”.. Oh.. JTT (Jonathan Taylor Thomas) when he was in Home Improvement. Nowadays… As I said before, David Boreanaz is still on the list, added with Orlando Bloom, Johnny Depp, both Wilson Bethel and Scott Porter (“Wade” & “George” from Hart of Dixie), and the Sam Trammell (Sam Merlotte) from True Blood (I really must watch more of that show!). It’s currently summer time here in Australia, which is probably one of my favourite seasons. But with any season, there are days I love it and days I hate it. Summer to me, and what I love, is a hot afternoon, where the sun is blazing in the sky and there’s a faint smell of smoke drifting in the air from some distant bushfire. It’s the cool breeze which picks up just before the summer storm rolls in. The lightning on the horizon, the fresh smell of rain mixed with the smell of freshly cut grass. Raindrops on the roof, claps of thunder overheard and the instant drop in temperature. The lazy days spend lazing around a friends house or a beachside apartment. Lying in a hammock or on the couch, while laughing & telling stories or just relaxing in quiet company – usually drifiting off to sleep only to be rudely awoken by one of your dearest friends. BBQs with friends and family, frisbee in the park, walks along the beach which end in a water fight in the ocean. Warm nights spent sitting on a balcony with a cold drink and good mates. The things about summer which I could do without would be the humidity (of course, if you have air conditioning then this may not be an issue). Those days where nothing you do keeps you cool. Clothing & strands of hair stick to your skin. Everything you try to do causes frustration. Just getting up off the couch is a lot of effort in this heat. Sleeping at night is near impossible – it’s just too hot and sticky. Even a cool shower or dip i the pool is useless, as soon as you’re out of the water you’re right back where you started. The ants. They seem to think they can take over your kitchen as soon as the rain comes. Leave an empty drink can on the bench and it disappears under a mass of tiny moving black bodies. They’re only small by they sure hurt when they bite! The flies. They’re never invited to your BBQ or Christmas day lunch, yet they’re always there with their entire family! The destruction caused by cyclones, fire & flood. I’m a weather nut and actually love all these things, but I love them when it’s mother nature at her finest – not when it becomes a situation of mass destruction and life or death. Oh the plus side though, you see the true aussie spirit shine through and everyone bands together to help out complete strangers, and get everyone back on their feet to fight another day. Why not… I didn’t manage to keep up with the Simplify Your Life posts last year, lets see how long Listmania hangs in there eh? I’ll start off simple! Listening to: My regular breakfast crew returned to work today on my local community radio station (98.9fm) so getting back into my country after a few weeks break. Laughing at: My new guinea pigs antics! Swooning over: Nothing really this week! Feeling: Hot & uncomfortable – which this humidity would bugger off and leave us in peace! Otherwise just tired and run down, need a break! Cooking: Enjoying the new breadmaker and looking forward to trying to make some brownies or something on the weekend! Wondering: What I should do for my sisters hen’s night/bridal shower! I can’t say for certain they are all “values” but it was a starting point. There’s also many more I could potentially add, but that’s just what I started with. I wrote my list then I hit another wall, how do I come up with my top 5? While I was thinking this over last night I decided on another approach – “what values do I want to pass onto my children?” I figured this would help me identify my top 5, as they would be the ones I’d most like my children to adopt. So from these two lists, and I know there’s overlaps, I need to find a top 5. Number 2 – I was going to put Equality, but went with Humanity as I think it encompasses equality a bit. Even though we are all different, and being an individual is ok, everyone has a right to be treated equally and seen as humans. No matter who you are, where you’re from, level of education etc etc everyone should be able to get the same opportunities and treatment. Yes, I know this is a far from perfect world but if I can teach my kids this, then it’s one step in the right direction! Help out when and where it’s needed, share a smile or a kind word. Not to the point of allowing people to walk all over you, but doing the little things that we so often forget. Saying please and thank you, greeting people you meet not with a grunt, but by name! Acknowledging your neighbours in the street or at the shops. I want my kids to grow up knowing they can be honest with us and tell us things. Even when I was 25 I didn’t feel that I could tell my parents I had a bf because I was afraid of what they’d say. We never really talked about those things much so it was foreign territory for me! I don’t want my kids to feel that way! I also want them to be honest with themselves. Now, I ummed and arhhed over putting this last on my list for awhile, but these are MY values so shush! Lol. It’s not that I value my family less, it’s more that in my mind, being an individual and knowing yourself is important to gaining a foothold in society. I love my family and they’re important to me, but they’re not my entire world (keep in mind, I’m referring to my parents and sister mostly here. I have no doubt this will change once hubby and I have kids of our own!). I have looked at one of my friends whose family is super close knit and I sometimes wish I’d had that with my parents. But then I realize that if I had, I probably wouldn’t be the woman I am today. So Deb from Home Life Simplified has given us our first Challenge of the 52 Weeks to Simply Your Life Challenge. This week, we’re focussing on what went “right” in 2011. At the end of 2010 we had decided we wanted to “create” our outdoor living space – by which I mean work on the garden and build a back deck. During the Easter break hubby & our neighbour ripped down the walls to the old laundry and built us a lovely timber deck. It immediately gave the house a whole new feel! Rather than walking down into the dingy laundry, we can walk out onto the deck and are greeted by mother nature. We also made progress in the garden. I have a small corner veggie garden in place, and successfully grew some potatoes, tiny carrots and snowpeas during the year. I also grew celery, onions, and broccoli but not quite so successfully! My garden however is currently full of weeds and needs some TLC to bring it back to life. I have some sweet potato planted but no idea how it will go against the weeds! We managed to cut down some trees and pull out old vegetation from along the back garden, ready to breathe new life into it. We’re a long way from done but it’s been greating spending time outside in the garden with hubby and working together on our little projects. Even with the weeds, it’s so peaceful to walk out and sit on the back deck, or take a chair out into the yard and just sit for awhile. There’s always heaps of birds around, and hearing the kids next door laugh and play is wonderful. We also made the decision to start trying for our first child. Though we haven’t officially kicked that off yet, the decision was made and we were both happy that it was. We’d spoken about it, but there was never any ‘yes, okay lets start trying “insert timeframe here” ” type decision until mid-year. I had already spent plenty of time (as you do) reading about what i should be doing to get my body ready etc. So with that came the decision to try and eat (and shop) better. This has resulted to alot less take out meals and frozen meals, and alot more visits to the butcher and my cook books! I’m not the most creative cook, but we have a small number of simple recipes that I rotate around throughout the week. I am hoping to expand on this during the year though, as there are some nights the thought of steak & vege or stir fry really isn’t appealing! During 2011 hubby and I also spent many nights curled up together on the couch, watching telly and just enjoying each others company. Or perhaps he would build some left or sort out some dvds while we watched a movie, but it was time spent together which was wonderful. I’m hoping for many more nights like this while it’s still just the 2 of us! On the work side of things, hubby started volunteering towards the end of November and has loved it. I think having time to dos something he really enjoys has agreed with him! My boss sat me down and told me how much I was appreciated and how lost she’d be without me, the payrise she gave me was a just a bonus to hearing that I was appreciated! All in all, 2011 wasn’t a bad year for us. I think it was a good year and we’ve each grown, both individually and as a couple. With any luck, 2012 will see us grow even more. Well a new year is upon us. For me, it brings with it all sorts of exciting possibilities! I got an idea from “The Organised Housewife” (http://theorganisedhousewife.com.au/) and put together a simple little poster of words that relate to things I want this year. Create – I want to create more. I love sewing and have been making stuffed toys for the last few months. I want to keep doing this and expand into making clothes. 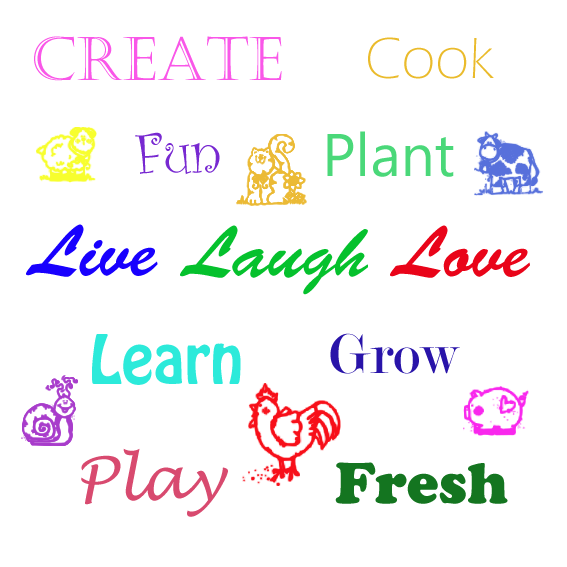 Cook – I want to enjoy cooking, not feel that it is a chore. I received a new recipe book for Christmas from my in-laws and I’m hoping to find some new inspiring ideas! Fun – I want to have fun spending time with family and friends. Time with my friends is little and far between, so I’ll make more of an effort to see them – even if its just for a quick coffee! Plant – I want to revive my veggie garden which is currently hiding under a thick bed of weeds. I also want to get to work on the rest of our garden. Learn – I want to learn more – whether it be new recipes, how to sew clothes or continue my on-line spirituality course I started 3 years ago! Grow – I want to grow as a person, and help my family to grow. Play – I want to play more which I guess links in to the Fun part. With plans to have kids, I can’t wait to spend time playing with my own baby. It also means I want to spend more time doing things I enjoy, and less time doing housework and chores. Fresh – Looking at things from a fresh point of view, buying fresh foods, making our own food (bread & pasta!). Start of a new year, and I thought I might try something different. I used to keep an online journal when I was a teenager, so I’m not really new to this but it has been years since I last used it and I’m sure my reason for writing has changed greatly! This year I’m on a mission. A mission to try and make a better home life for myself and my family. I have a loving husband who is my world, our own house that is our home and a dream to start a family and fill our little home with laughter and giggles. In order to be the loving wife and mother I want to be, I need to at least feel like I am control of the house, and not have the house controlling me! By which I mean, not feeling like that pile of dishes in the sink is running my life and looming over me everytime I walk in the door. I want a home that is easy to maintain, where doing chores doesn’t feel like hard work. In order to do this though, I need a little motivation! Join the 52 Week Challenge!